Description: Early county map of Lincolnshire with decorative cartouche and compass rose. 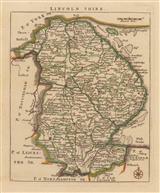 Description: Grand Dutch Golden Age county map of Lincolnshire with coats of arms. Dutch text on verso. Rich original hand colour. 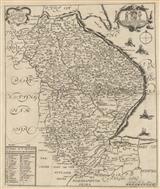 Description: Attractive and rare map of Lincolnshire with a small chart detailing its Hundreds on the lower left. There is also a small dedication to Robert Bertie, 3rd Earl of Lindsey and Lord Lieutenant of Lincolnshire. Description: County Map. Inset plan of Lincoln. Decorative coats of arms. Hand coloured. Description: County map. Inset Lincoln town. Cartouche and coats of arms included. 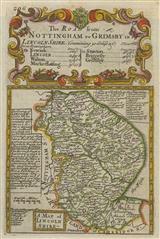 Description: Early county map of Lincolnshire. Coloured. 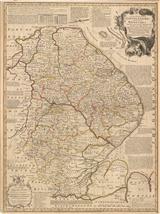 Description: A charming county map with text and decorative table of distances between towns. Coloured. Description: Lincolnshire. 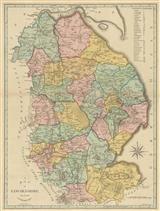 Countymap divided into its hundreds with detailed and decorative borders. Original colour. 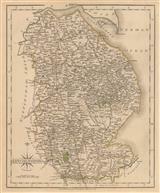 Description: Fine copper-engraved county map of Lincolnshire surrounded by descriptive text and decorative vignettes. Original hand colour. 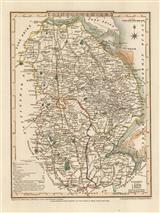 Description: A rich and detailed map of Lincolnshire taken from Bowen’s landmark survey of Georgian England. Original colour. Description: Lincolnshire. Miniature county map. Coloured. 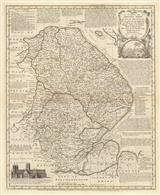 Description: Attractive county map of Lincolnshire by the cartographer to the Postmaster General, accurately plotting England's roads. Original colour. Description: Attractive map of the county of Lincolnshire highlighting the developing road network during the Industrial Revolution. Original hand colour. 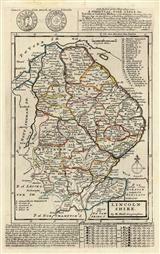 Description: Lincolnshire, a detailed and attractive county map published in the early 19th Century. Original colour.